Whomp whomp. There're no Morgans for sale. Morgan Jones is a main character and survivor of the outbreak in AMC's The Walking Dead. He is the husband of Jenny and father of Duane. While evacuating, Jenny was bitten and succumbed to the infection, causing Morgan and Duane to seek refuge in King County, Georgia, where the Grimes family lived. 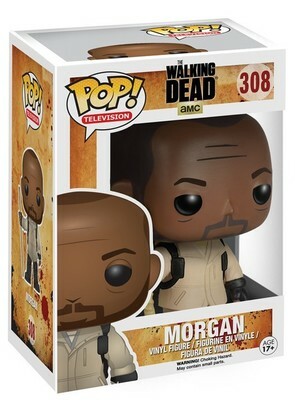 After the loss of his son (who was bitten by Jenny), Morgan was living a life in denial, hoping to redeem himself by killing the invasive walkers. At the end of "No Sanctuary", it is revealed that Morgan has partly redeemed himself and is on a journey to find Terminus before Rick Grimes's altered sign turns him away. After stumbling across a map leading to Washington, D.C., with a familiar name on it, he heads north until he crosses paths with Daryl Dixon and Aaron, recruiters for the Alexandria Safe-Zone, who bring him to the town where he is reunited with his long lost friend, Rick Grimes. His weapon of choice is a wooden staff.